Walt Disney World boasts more than 150 restaurants and Disney has put the same amazing theming and attention to detail in each of their dining locations. Like the rest of Disney World, there is a lot information out there about the restaurants at Disney. Here are 8 things you might not know about Disney Restaurants. 8. At Animal Kingdom Lodge you will find award winning restaurants Jiko, Boma, and Sanaa. If you go to the podium at Boma at 4:00pm you can go on a mini half hour tour of Jiko, Boma or Sanaa. These tours don’t take you backstage and are not overly in-depth like many of the other Disney tours, but you will learn about some of the decor and the ideas and inspiration for the architecture of the restaurants, and they will also go over some of the menu items. If you’re lucky, you may even get to sample some of the dishes. If you don’t have a dining reservation for any of these restaurants, this is a great way to take in some of the atmosphere and theming. 7. Think character dining is the only kind of dining entertainment out there? Think again! Many restaurants offer fun entertainment during meals. If you head over to Disney Springs, the Irish pub-style restaurant Raglan Road offers Irish bands and step dancers in the evenings. Often the dancers will bring young children up on stage and teach them a few steps. This is a great experience for kids and their parents. There are similar experiences and entertainment over at EPCOT at Biergarten and Restaurant Marrakesh where there is live music and dancing in the evenings. 6. If you are celebrating a special occasion, planning a birthday surprise, or popping the question, let the restaurant know ahead of time. In true Disney fashion, many will help add a little extra pixie dust to your special dining experience. If you are celebrating a birthday at the Crystal Palace, you will receive a beautiful card signed by Winnie the Pooh and his friends. If you ask, the cast members at the restaurant may help arrange for a character to give a present (that you provide) to the person in your party celebrating a birthday. You can also arrange for a cake to be delivered to the restaurant. Cinderella’s Royal Table offers a number of packages to celebrate a special occasion, be it a birthday, anniversary and they even offer the Glass Slipper Engagement which includes a glass slipper presented on rose petals and a Disney photographer to capture it all. 5. Since opening in Fantasyland in 2012, Be Our Guest Restaurant has been in high demand and many struggle to secure a dinner reservation here, even 180 days in advance. A great alternative is making a reservation for breakfast or lunch, which are quick-service meals, but allow you to experience the same atmosphere and theming that you would get with a dinner reservation. If you do have a breakfast or lunch reservation, you are able to place your meal order in advance. 4. There are more character dining experiences that you might think. The popular spots in the parks fill up quickly with advance reservations, so if you are disappointed to find out that the Crystal Palace or Cinderella’s Royal Table is booked during your visit, you may have luck meeting characters at some of the resort restaurants. Over at the Grand Floridian is 1900 Park Fare where you can meet Alice or Mary Poppins during the day, or Cinderella and Prince Charming at Cinderella’s Happily Ever After Dinner. Reservations are still highly recommended, but it’s good to look beyond the parks for some amazing character dining. 3. 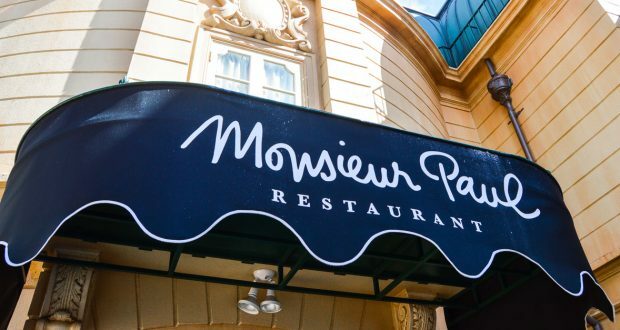 There are a few restaurants at Disney World that may give you the option of ordering from the Prix-Fixe menu which allows you to choose a multi-course meal from a list of specialty items. This is usually a better deal that if you were to order those items off the regular menu. Chefs de France and Monsieur Paul often offer a Prix-Fixe menu in addition to their regular menu. Be Our Guest for dinner and Artist Point Storybook Dining are also excellent Prix-Fixe meals. It’s definitely worth considering if you will be getting an appetizer, main dish and dessert anyway, and you will most likely save a little money. 2. Follow your favorite restaurants at Disney World on social media. Many of the restaurants in the parks, Disney Springs and the resorts can be found on Facebook, Twitter or Instagram, and some are known to offer special discounts and coupons. Paddlefish at Disney Springs has offered a discount of 10% off your bill at times if you share a photo of your meal on Facebook. Other restaurants offer loyalty cards or newsletters, which include discounts and promotions. 1. There are a few dining experiences and reservations that require not only advance reservations, but also payment in advance. If you’ve never dined at Cinderella’s Royal Table, then you may not be aware that you will be charged for your meal in advance. However, if you do have to cancel your reservation you will be refunded. This is a spectacular dining experience so this definitely shouldn’t deter you from making a reservation in advance, it’s just good to know ahead of time! We have just scratched the surface of the inside knowledge about the restaurants at Disney. What are some things others might not know that you’ve discovered about dining at Disney?